- Mounting pole telescopes from 18" - 24"
The LCD-DM2 allows for two LCD-1 mounts to be attached onto a desktop via clamp-on or bolt through. Accommodates most flat panels 10" to 23" with a combined load capacity of 50 lbs. 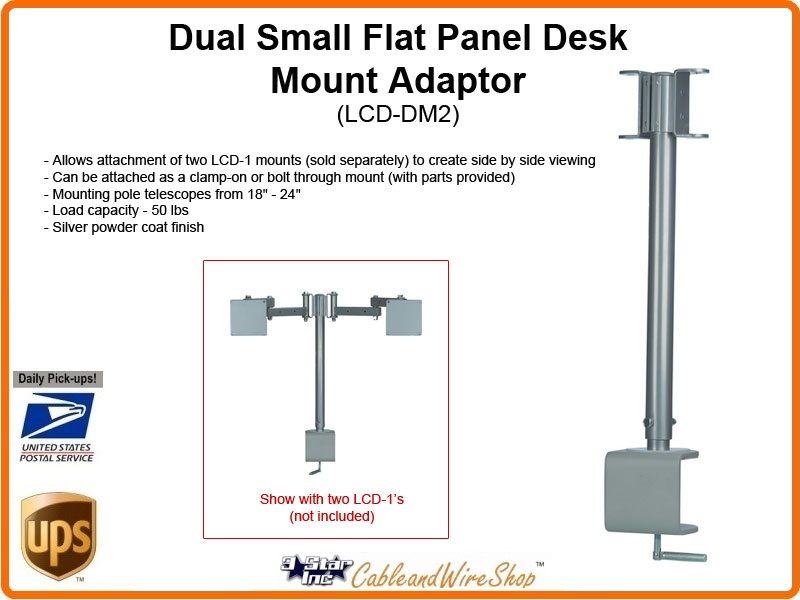 Cable & Wire Shop sells small TV mounts for flat panel displays 10" inches and up. Raise your TV off the shelf and choose from flush wall mounts, rotational mounts, and mounts that tilt to make your LED or Plasma HDTV stand out. If you are looking for a mount for a larger display we also carry Mid Sized Wall & Ceiling Mounts for TV and Large Flat Panel Mounts for TVs 37" and up for home and businesses alike.